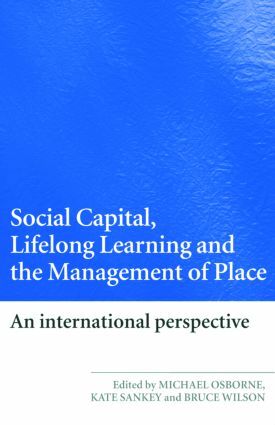 With contributions from around the world, this book brings together inter-related research from three fields: social capital, place management and lifelong learning regions. Providing valuable insight into the management of place and the development of learning at a regional level, the book presents international research that underpins the development and implementation of policies and practices that improve the quality of living and working circumstances at both local and regional levels. International in scope and at the cutting edge of research into this growing field that links lifelong learning to place, the book will appeal both to academics undertaking research in this burgeoning field and to those involved in lifelong learning at local, national and international level. What should count as ‘evidence’ for effective ‘situated policy’? ‘Cultural presence’ and disadvantaged groups: Do HEIs make a difference?